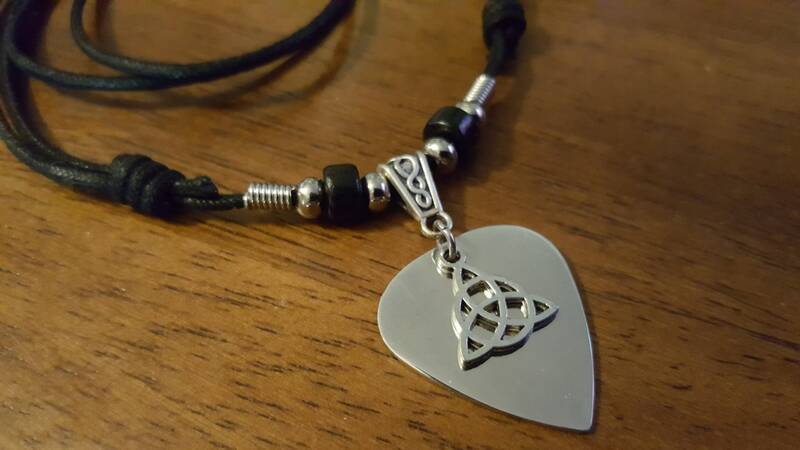 This is one beautiful stainless steel guitar pick necklace, it has a cute Celtic triangle dangling on the front side of the guitar pick, and it can be worn as a necklace or a bracelet. This Guitar pick necklace is strung on a strong adjustable 2mm black cotton cord and has black ceramic beads. The guitar pick necklace has metal springs and metal beads to add contrast to this piece. This guitar pick necklace is beautiful! It measures approx. 18" at it's smallest diameter and 24" inches when it's expanded by simply sliding the cord through the slip knots. Another great idea for this guitar pick necklace would be to take it with you to your next concert and throw it up on stage for your favorite guitarist/singer! =) It's a lot better than roses! Or...if you are a musician in a band, you could throw it out to the crowd at the end of the night! It's better than just throwing out a pick or perhaps you'll just love this guitar pick necklace too much to part with it! I've given these to many of my friends who are music lovers. They love this guitar pick necklace!